2010 Schedule Last race: 911 Tribute brings out the best! 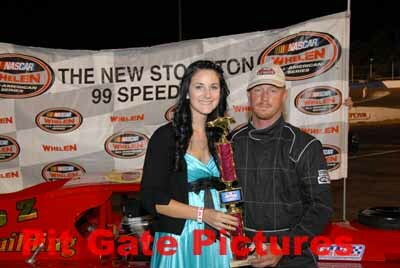 On Saturday, September 18th, the NASCAR Whelen All American Series was back in action on the Toughest Test in the West to Crown Four Champions when, on Fan Appreciation Night, Whelen Presented Championship Night at the Speedway. On the docket for this Racing Spectacular was the Western Late Models in Twin 40's, Grand American Modifieds, Street Stocks, Bombers and the Mini Cups. It’s been a long year that has gone by seemingly quick. But all the hard work and dedication culminated on this one fantastic night of racing in front of nearly 2000 ecstatic fans in the stands. 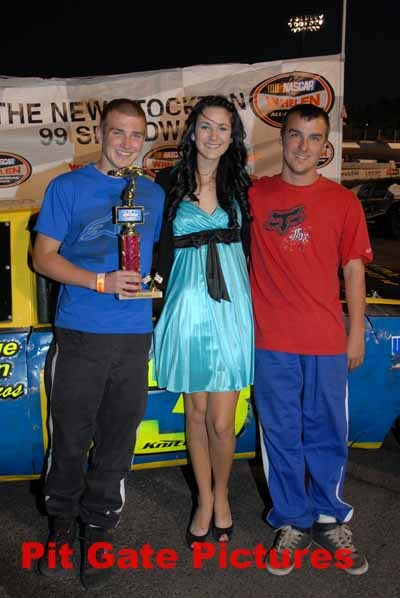 This would be one evening several drivers would never forget as they clinched Track Championships in their respective Divisions. Hard work, perseverance and a lot of luck, this is what it all came down to in the end at the storied Venue. Tonight would be a storybook ending for “The Iceman” Chad Holman by capturing the Western Late Model Crown in his Rookie Season, which added to his 2006 ALSC Title at Stockton. In the beginning, Boyd Camper Racing got started as an experimental package. They were going to run on a hit or miss basis just as most other teams have done this year due to the ruptured economy. However, when early May came around and they found themselves sitting atop the charts, everything changed because they thought they just might have a shot with Holman’s consistency. Of course, Crew Chief Josh Bews, bringing his vast knowledge of set-up to the table, certainly didn’t hurt matters any. Nor did motor-man, Leroy Hunt, whose countless hours of hard work and dedication enabled the team to produce the kind of horsepower they needed each week to get the job done. Asked what he thought about his rookie year, Holman said, “I have gotten all out of racing that I ever wished for, and if I was finished today, I couldn’t ask for a better ending.” By the way, Holman has five sons, so this might just be the beginning of a long and storied history in racing. Congratulations to Chad Holman and the entire BCR Team on an absolutely fantastic year. When the Western Late Models hit the speedy surface for Twin #1, Modesto’s Jeff Belletto (12x) put all his cards on the table and was dealt a Royal Flush as he crossed below the checkers in grand fashion for his first victory of the year. This much-anticipated race got underway with Points Leader Chad Holman (9) of Stockton pacing the twenty-two-car field to greet the green with Belletto glued to his right door handle. Belletto got a great jump from the outside and drove hard into one to gain the holeshot only to be slowed three laps later on lap 3 when second generation driver Colby Potts (12) came spinning out of turn two with perhaps a little help, but nonetheless, it brought out the first caution period of the race. On the restart, Belletto assumed the point followed closely by Roseville’s Zane Lovelace Jr. (46) until lap 4 when Defending Track Champ and second generation driver from Tracy, Justin Philpott (05), came to rest high between one and two which immediately caught the attention of the flagman who sent the yellow waving. On the ensuing restart and several thereafter, the story never changed up front with Belletto leading the way, despite some gnawing pressure on his back bumper applied by Lovelace throughout the race. Of course, being the veteran that he is, Belletto never succumbed to the young driver’s aggression as he crossed beneath the checkers, Lovelace still connected to his rear bumper, for the victory, his first of the Season. 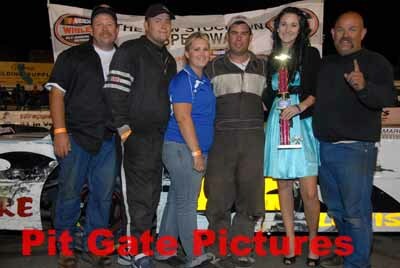 Lovelace, a fine young driver, would finish second to continue his great-run streak at Stockton this year. Brentwood’s Doff Cooksey, with another solid run, finished on the podium in third. 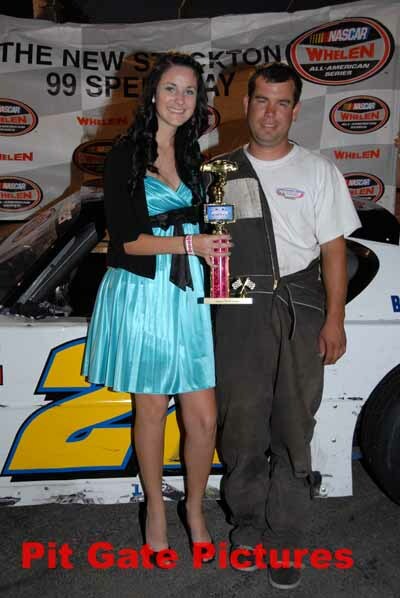 Points Leader Chad Holman, after some extremely close calls at different times during the race, managed a fourth place finish, and in doing so, Holman clinched the Crown for 2010 in the Western Late Model Division. Modesto’s Todd Corral brought her home with another strong run in fifth. With an invert of eight, the second Western Late Model Twin boasted another twenty-car field off number one. 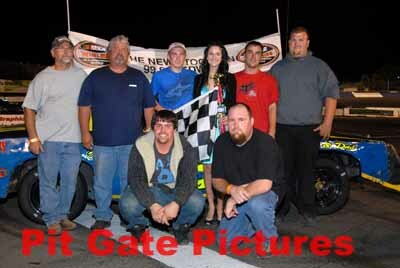 However, the outcome this time around was much the same with Jeff Belletto taking home Top Honors once again. The #88 of Glen Hutchison, through luck-of-the-invert, would start this one on point with rising young star, Mike Sandoval (17) of Ripon tight and high to the right. Sandoval would lay claim to the lead on lap 1, but Hutchison slid by down the back-stretch to overtake the #17 on lap 2. Over the next fifteen laps, Hutchison would control the number one slot, but not without tenacious pressure over the entire length of his car by 2010 Champ, Chad Holman (9) of Stockton. Unfortunately for Hutchison, on lap 16, Ron Robeck (3) of Milpitas had spun between turns one and two and was sitting dead in the water when Hutchison went flying through the corner and didn’t see Robeck as he plowed hard into the side of the #3, ending his lead and his night. On the restart, Holman grabbed the point, but the restart didn’t go and Holman headed to the pits with a right front going down, handing the lead over to Sandoval. Much to Sandoval’s chagrin, Belletto had moved into second and with the green flag flying, Belletto grabbed that certain huge hunk of forward bite as he drove this one into the books by winning both Twins on this night. Sometimes the best car doesn’t win, but tonight, one of them did. “Actually, we were really surprised to win both of these tonight,” said the always gracious Belletto, “There was a good field of Late Models tonight. Starting up front with Chad (Holman), I knew he had big picture in the back of his mind, so I felt he was going to give me plenty of room and he did. It all worked out great.” Escalon’s Cody Hodgson (55) had his best finish of the year in second with Trevor Schlundt (28) finishing on the podium in third. Carlos Vieira (51) of Livingston had a great run after earlier difficulties, finishing fourth while Holman brought her home in the number five slot. This one was called on lap 36 after half the field was collected in the big one down the back-stretch. 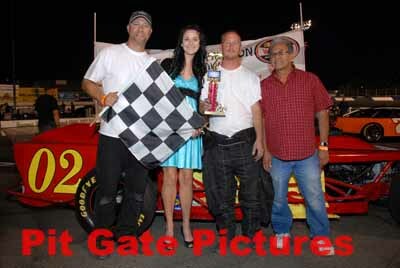 In the Grand American Modified Division, the Championship coming into this night was a foregone conclusion, but that didn’t deter Rich Lindgren (02) of Rio Linda from his appointed course as he crossed the stripe ahead of the field after what was a magnificent battle. This one got underway with the #2 of Ryan Peter and Lindgren sharing the front row. Lindgren grabbed the early lead from the outside in what seemed to be a pattern emerging through all the races on this night. Unfortunately, on lap 8, Tony Noceti (6) of French Camp and the #3 of David Strickland made contact just past the flagstand which brought with it the first yellow on the night. On the restart, Lindgren continued to hold service over Peter for the next several circuits until lap 14 when Strickland lost a wheel and came to rest against the turn four pit gate bringing out the second yellow of the race. On the restart, it was all about Lindgren, but not without several challenges over the next sixteen laps until finally, Lindgren had nothing left but the checkered flag and the sweet taste of victory. Andy Vanderveer (49) finished in a very close second with the #21 of Austin Songster on the podium in third. Peter fell off a bit but still managed a fourth place finish while Stockton’s Larry Tankersley (96) completed the top five. This race was plagued by a total of four yellows and one red. Congratulations go out to AJ Ryder and the entire Cherokee Muffler team for their Championship Season. 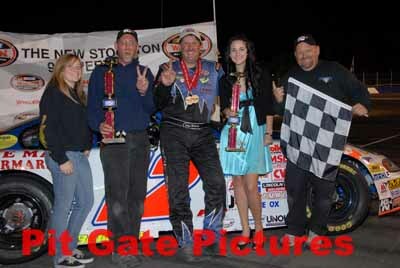 Ben Lewis II (22) of Stockton pulled off a surprising upset by winning his second Street Stock Main of the year. However, it would be simply too little, too late to overtake Points Leader Sammy Solari (79) for the Division Crown. Solari was offered $300 to start at the tail-end of the field, but he had to win to collect. If he didn’t win, the winner would collect the prize, which is exactly what Lewis did. Atwater’s “Racin” Jason Aguirre started on pole with West Modesto’s Garland Tyler alongside for the ride to get this one up and running. Aguirre, in his usual smooth style, grabbed the lead going off into turn one where he would hold strong until lap 8 when Stockton’s Lance Butler looped it in turn four and was sitting dead in the water when the flagman had no choice but to send the first yellow in the air. On the restart, Aguirre took immediate control of that much-coveted real estate out front, while at the same time, Solari had moved into fifth. On lap 25, Solari moved into second and the epic battle that ensued over P1 was immeasurable with Aguirre and Solari trading punches lap after lap until 37 when the two made final contact coming down the back-stretch and Solari got turned into the wall which ended his night. Of course, Aguirre was sent to the back, much to the displeasure of the fans in the stands. Following the fracas, Lewis gratefully inherited the lead where he drove off to the surprising victory. Robert Daniel (17) of Lodi finished a close and impressive second while Tyler dropped off, if only slightly, to finish on the podium in third. “Rompin” Rich Harper (5) of Stockton brought her home fourth with Livermore’s stealthy Mark Squadrito (3), always showing up on the radar by race’s end, brought her home to finish fifth. After a great year of racing, which included a total of eleven wins, Congratulations to Sammy Solari and the Gabtron Racing Team on a dominating Season. Travis Tucker (350) of Stockton needed only take the green to take home the victor’s share of the spoils for his first-ever Championship. And he did just that, yet not quite so convincingly. 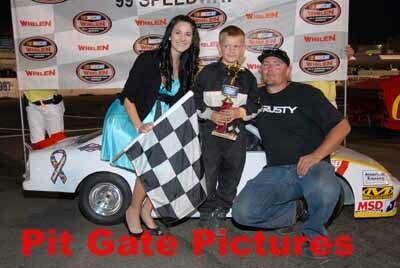 But he would have to share the front-stretch with race winner Robbie Knittel (003) of Lodi. Before the hoopla could commence, however, this one got up to speed with Matt Wendt (002) of Lodi at P1 and Stockton’s own Tom Dahl (004) at P2. Wendt grabbed the early lead and showed extreme strength in doing so with a power move off into turn one where he would shift to cruise-control over the next fifteen laps until lap 16 when KC West (500) of Stockton went spinning up the track between turns one and two which brought with it the obligatory yellow flying in the night sky. After a quick caution that turned into a lengthy red for issues unrelated to racing, this one got back underway on the lap 16 restart with Wendt and Knittel neck-n-neck for the next couple go-rounds until lap 18 when Knittel decided he was going to finish this Season with a bang as he snatched the top spot away from Wendt and sped off to the checkers as he has done five other times this year in what amounted to a near-miss as far as clean sweeps go. 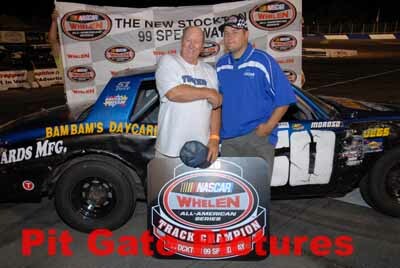 “I would like to thank all my sponsors and everyone else who helps on the car,” said the young Lodi driver, “I want to congratulate Travis (Tucker), he deserves the Championship.” Wendt held on to finish second, but upon further review during post-race tech, track officials deemed the car not up to specs and Wendt was disqualified on the spot which moved all drivers finishing after him up a spot and gave Dahl second place. 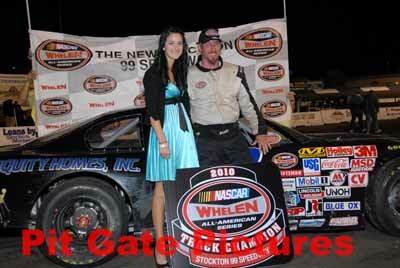 Jeremy Tucker (051) of Stockton benefited with a podium finish in third with 2010 Bomber Champion Travis Tucker, fighting a no-brake situation all night, bringing her home fourth and clinching the Division Title. "This feels great. It's been a great experience," Tucker said. "I didn't have any brakes at all, so I laid back early and tried to have fun." The #043 of Andy Rumsey rounded out the top five. Congratulations to Travis Tucker and the entire 350 Racing Team on an outstanding Rookie Season which brought with it the Big Trophy. Our newest Division, the Mini Cups, had an up and down year as most new Divisions do, but nonetheless, they produced some very good racing, and tonight, Points Leader Cody Johnston (50) would win his third race of the year. Landon Reynolds (57) of Manteca started this one on pole with Johnston at his side. Johnston took the immediate lead and held on all the way through to the checkers. To Reynolds’ credit, he gave it his all, but mechanical issues plagued his car all day and he had difficulties hanging on under power. With two race left, Johnston finds himself 88 points to the better of second place and is pretty much a lock for the Championship. On September 25th, please join us as Robeck's Welding & Fabrication presents BIG BUCK$ for the “B” Divisions with the Bombers, Basically-4-Cylinders, Legends of the Pacific, Mini Trucks/Mini Stocks, Bandoleros, Mini Cups, and Vintage Hardtops. In the Bomber Division, $500 is up for grabs for the winner of their Main Event. In the Basically-4-Cylinder Division, $250 goes to the winner of their Main Event. Also, General Admission will be $10.